75 years ago - Kalandro is born in Atlantis. 59 years ago - 16-year-old Kalandro becomes an outspoken zealot for the return of Atlantis's ancient religion. 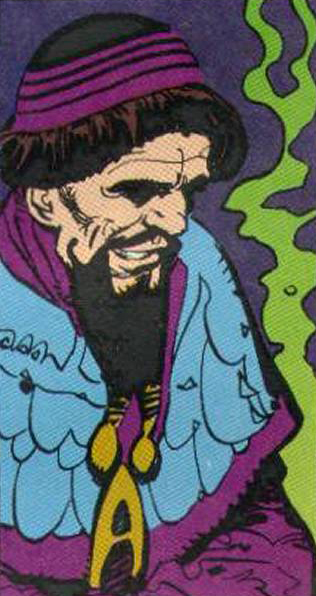 52 years ago - 23-year-old Kalandro discovers the existance of Orm Marius, the King's illigitimate son. He takes in the boy and raises him to one day usurp the throne. ​43 years ago - 32-year-old Kalandro's followers are joined by Thorne in order to advance his own resources. 41 years ago - 34-year-old Kalandro and his followers demand that the King & Queen's newborn son Orin be abandoned on mercy reef and sacrificed, claiming that the king's order to end Thorne's experiments reveal that he is being affected by a curse. 38 years ago - 37-year-old Kalandro is placed in control of the reinstated theocracy as Orm Marius killsThorne the king and queen and takes the throne. He names Thorne the chief royal scientist. 24 years ago - 51-year-old Kalandro and his followers become the sole arbiters of magical power in Atlantis when all magical adepts are banished to Idylis by Orm Marius. 11 years ago - 64-year-old Kalandro goes into exhile when Aquaman sucessfully retakes Atlantis, his followers becoming terrorists working to undermine the new ruler. ​7 years ago - 68-year-old Kalandro and his followers are joined by the escaped Orm Marius, who takes command of his forces. 6 years ago - 69-year-old Kalandro joins Orm Marius's attack on Atlantis, but they are betrayed by their ally Black Manta, who kills Kalandro when he attempts to stop him. ​This is, in essence, an almost entirely original character. Our new story for the betrayal and sacrifice of Aquaman, as well as the rule of Orm before Arthur retakes his throne, clearly needed a religious zealout to back Orm's coup. This meant that Orm would basically be a pupper ruler of an oppressive Atlantean theocracy, but we actually want Atlantis to NEED Arthur to come save it, and this was such a cool way to do it. So where does Kalandro come from? The character appears in Peter David's fantastic miniseries Chronicles of Atlantis, something he did as a precursor to his run on Aquaman. If you haven't read it, I urge you to, it's great stuff. We haven't adapted it into our timeline, but as a standalone pice of comic fiction, it's just stellar. In the final issue, as Atlantis is depicted just prior to Arthur's birth, we see the once great city in decline, and we meet the religious zealots that convince the king to abandon newborn Orin because he's a "curse and ill omen." Kalandro was the leader of these zealots. ​So the character does technically exist, but only with that one minor appearance. SInce we had a much larger role for an outspoken zealot to drive the political intrigue of Atlantis, we created a much larger story for him, even though, in the end, he's not really a traditional comic book villain. Actually... given the fact that he winds up being a pretty strong allegory for religious extremism in our story maybe it's best if we don't go with this exact appearance for him? It's probably better if he doesn't look like he's meant to represent any particular real-life religion or ethnic group.